Indian GSM operators continued to suffer a drop in monthly additions. Overall, operators added 9.53 million connections in May, compared to 11.1 million connections in April, and 14.49 million in March and February 2011, according to latest data from Cellular Operators' Association India (COAI). India now has 590.19 million connections. 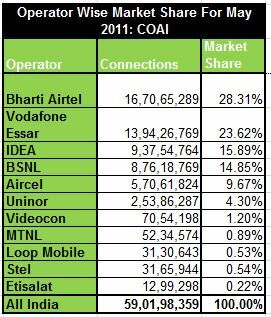 Airtel and Vodafone Essar both added 2.45 million connections in May. In comparison, Vodafone Essar had added 2.4 million GSM connections in April while Airtel had added 2.41 million. Now, Airtel has 167.06 million connections while Vodafone Essar has 139.42 million. For Idea Cellular, the month saw an addition of 1.8 million connections, much lower than the 2.45 recorded in April. Uninor added 1.14 million connections to reach 25.3 million connections. Interestingly, Videocon has lost 186,161 connections in the month of May to reach 7.05 million connections. In April, the operator had gained 134,399 connections. Loop Mobile has 3.13 million connections while MTNL has 5.23 million and Aircel added 1.1 million connections in May to reach 57.06 million connections. STel has 3.16 million GSM connections; Etisalat has 1.29 million connections. BSNL witnessed a fall in additions to 471,243 connections in May compared to 689,361 in April. In April, Reliance Telecom had 26.67 million connections in eight circles.